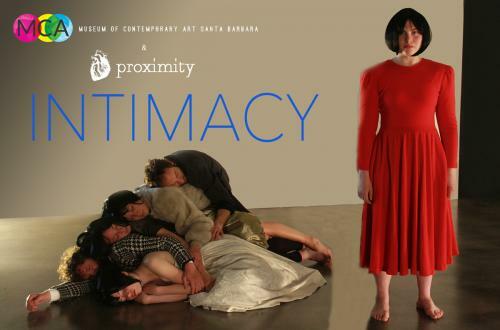 Featured as part of Museum of Contemporary Art Santa Barbara’s group exhibition of nine artists from Santa Barbara, titled Shift, Stretch, Expand: Everyday Transformations at MCASB Satellite @ Hotel Indigo, Kyra Lehman presents her performance, Intimacy. The artist defines intimacy as the ability to “stay within the truth of a moment in relation to yourself or someone else.” Both her sound piece in the exhibition at Hotel Indigo and her related performance at MCASB’s main location explore the beauty, absurdity, torture, and miraculousness of what it means to be human, both within our own skin and as we connect to others in the world. Throughout the entirety of Lehman’s artistic practice, she has been studying the human body and human experience. Known primarily for her work on stage, as founder and director of Proximity Theatre (est. 2007), Lehman’s primary medium is storytelling through directing and choreography. Her process involves the creation of riveting productions based on the performers’ discovery of authentic physicality, expression, and connection. Performances at 6:30, 7:30 and 8:00 pm. Seating is limited. Please email hello@mcasantabarbara.org to reserve seats or text (805) 450-9560. *This event marks MCASB's ongoing commitment to performance via our On Edge Performance Art Series and is funded in part by the National Endowment for the Arts.